Statistics show that at least four of every ten individuals will complain of sciatica. 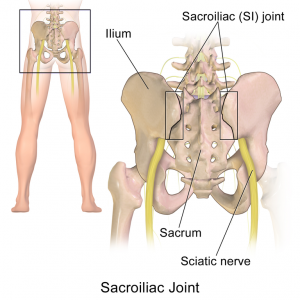 Sciatica is a medical name referring to the irritation or compression of the sciatic nerve. The mentioned nerve emanates from the lower spine and moves through the pelvis and buttocks. The sciatic nerve runs further along the back of the upper legs, then branches from the knee into many sublets that travel to the feet. It is known to be the longest and broadest nerve in the human body. The nerve controls multiple muscles located in the lower legs and enables sensation to majority of the lower leg parts. It is caused by the confining of the roots of the lumbosacral spine and the lower part of the lumbar. This may be triggered by the degenerative disc disease that leads to the breakdown of the discs that epitomize cushions between the vertebrae. Also, a condition where one vertebra slips ahead of the other may cause sciatica. Pregnancy, obesity, lack of body fitness, fractures, spinal tumors, infections and a narrow spinal canal at the lower back, all may lead to sciatica. Age causes some gradual change in the structure of the spine such as herniated disks that trigger sciatica. If a job involves heavy lifting and prolonged sitting periods they may contribute to the development of this condition. Being overweight is yet another stressing factor to the spine that may lead to sciatica, over time. Diabetes interrupts how the body utilizes blood sugar which may increase the risk of nerve damage that may befall the sciatic nerve. The main sign of the sciatica condition is a sharp pain anywhere from the lower back, across the buttock to either back of the legs but along the sciatic nerve. Some patients complain of numbness in the lower leg or tingling sensation like that of multiple piercing needles in the toes and feet. The sciatica pain differs with severity. In some circumstances, sciatica may be prevented through lifestyle changes that can cut down chances of the condition developing. These preventive measures include regular exercises to keep the back muscles strong and proper sitting postures to maintain the spine’s normal curve. Also, appropriate body mechanics help in retaining the right physicality when lifting heavy objects. With some causes of sciatica originating from the misalignment or pressure on the spine, the chiropractor may help with the adjustments. Doctor Jamalabadi specializes in offsetting pressure from the spine and realigning the spine. This comes after an exam aimed at determining the condition of the spine and the cause of the compression on the sciatic nerve. Once the pressure is off, the body should start to heal naturally. For sciatic nerve pain relief, medication will do the trick. Your medical doctor could prescribe pain killers such as aspirin and ibuprofen but they should be taken in moderation. Your doctor may want also want to prescribe something stronger such as steroid injections, tricyclic antidepressants, and muscle relaxants. Make sure you he/she makes you aware of any side effects these drugs can cause. Surgery is recommended in the gravest of situations when the sciatica pain is severe, and the symptoms keep progressing. Also, if all other treatments targeted at sciatic nerve pain relief fail, surgery could be the last resort. If you are experiencing any symptoms of sciatica, we would recommend to seek the services of a chiropractor for immediate correction. After a careful examination, Dr Jamalabadi will go over with you on the best sciatica treatment for you.